Minister of Health has recently promulgated the Decision No. 4210/QD-BYT dated September 20, 2017 providing for output data standards and formats used in management, assessment and payment for medical services covered by health insurance. The Appendix 01 which is used as reference for cases of special coinsurance percentages has been mentioned in the descriptions of the entry No. 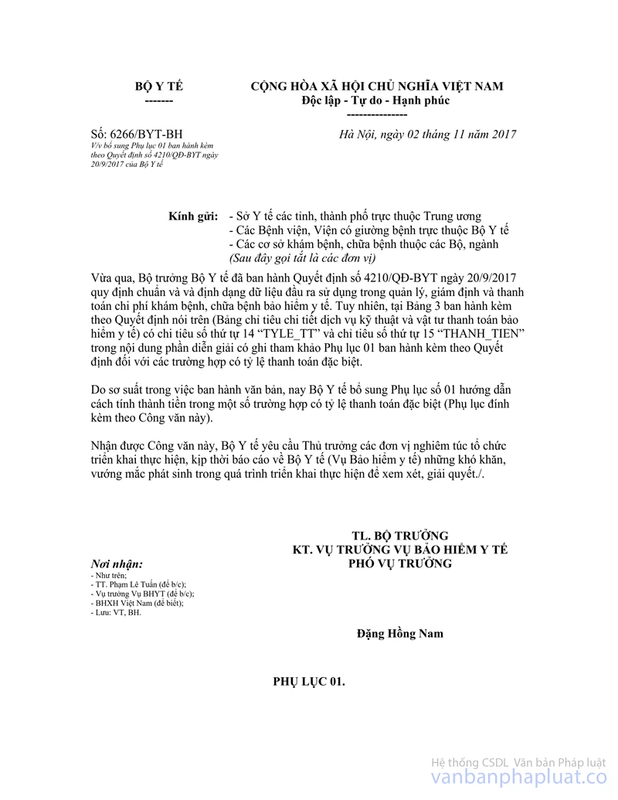 14 “TYLE_TT” and the entry 15 “THANH_TIEN” at Table 3 (Entries relating to medical technical services and medical supplies covered by health insurance fund) enclosed with the abovementioned Decision. Ministry of Health hereby supplements the Appendix 01 – Guidance on certain cases of special coinsurance percentage (The Appendix enclosed herewith) to the abovementioned Decision. 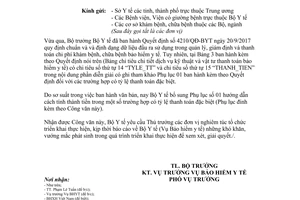 When receiving this document, concerned units are required to promptly organize the implementation of this document and send reports on difficulties that arise during the implementation of this document to the Ministry of Health (via the Health Insurance Department) for consideration./.